Home » Uncategorized » Take Us Up On Our Offer…Please! Take Us Up On Our Offer…Please! All over our website you’ll see us appealing to you – have questions, unsure about where to measure, wondering if you have the right place to install a Plisse screen? Then just drop us a line and if you can, include a couple of pictures. Because pictures really do speak a thousand words. With all of the appeals and all of the traffic you’d think we’d be inundated with emails and pictures but for some reason I think you guys think it’s an empty offer. Below a potential customer from League City, TX did take us up on our offer and here you can see that we keep our promises. 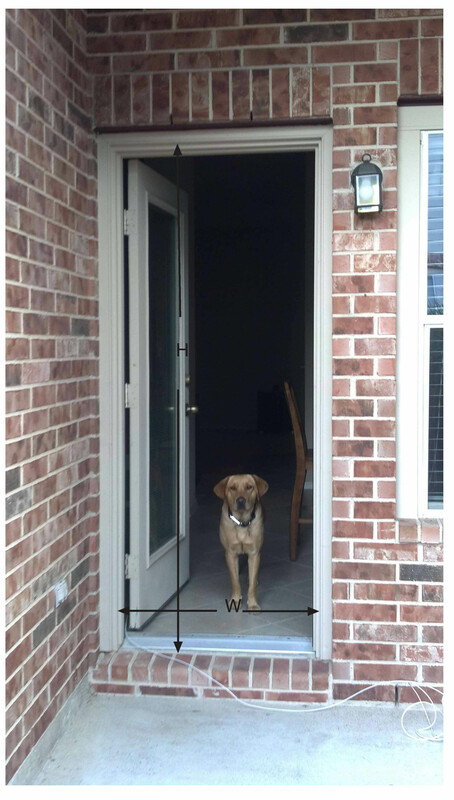 I have walked him through all of his questions about how our screen will differ from the one he picked up at Home Depot and never got installed properly, where he should measure, if he needs a threshold adapter and more. Take a moment to read through the string of messages. 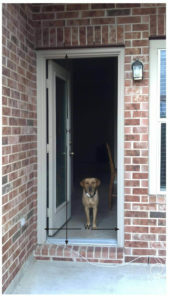 You may find that you’ll suddenly feel compelled to send us some pictures of your doorway (dogs always welcome, too!) or you may just find the answer to your own questions. Either way, we hope this helps! I’m glad you took us up on our offer. I’ve looked over the pictures you sent and think you’ll be able to order and install Plisse retractable screens easily on both doors. I made some annotations on the bottom back door image and re-attached it for your review. It looks like both doors are pretty much the same and so the notes I made should apply to both. The only other note I’ll add is that the handing on each is different: the side door handing would be left while the back door would be right. 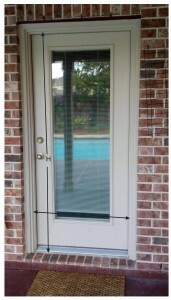 Do you have anyone in League City (in between Houston and Galveston) who can come out and install a Plisse door? We do not have anyone in that area but the installation is very simple. We custom cut and assemble and test the units here. We then take the top and bottom rails out for shipping. When you receive it all you have to do is put the top and bottom rails back in, stand the unit up into the opening and screw it in place with 6 to 8 screws. If you don’t think you can do it yourself any handyman or carpenter could do it easily. The most important skill needed is to be able to follow step by step instructions. Anyone who will follow instructions can install one. If you have any doubts about where to measure I will be glad to draw on the photos the exact place to measure. Thanks and let me know how I can help. 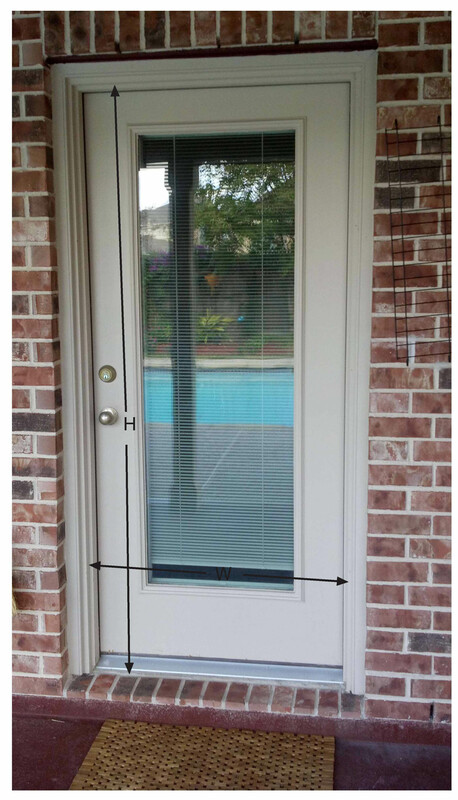 When I had tried to install the one from Home Depot, it fit the same area that you outlined in the drawing, but the problem was attaching the “hinge” side of the screen door (the large side which holds the rolled up screen) to the thin little peice of wood which makes up the internals of the door frame. The instructions suggested that peice of wood should be at least an inch wide, and mine is more like 1/3 inch. I had considered maybe putting a screen door right over top of the entire door frame, but that is 8 feet tall, hard to find a screen door that size. From the photo I am guessing that the dimension “B” in the bottom photo is more than ½” so our frame will mount there without any problem. 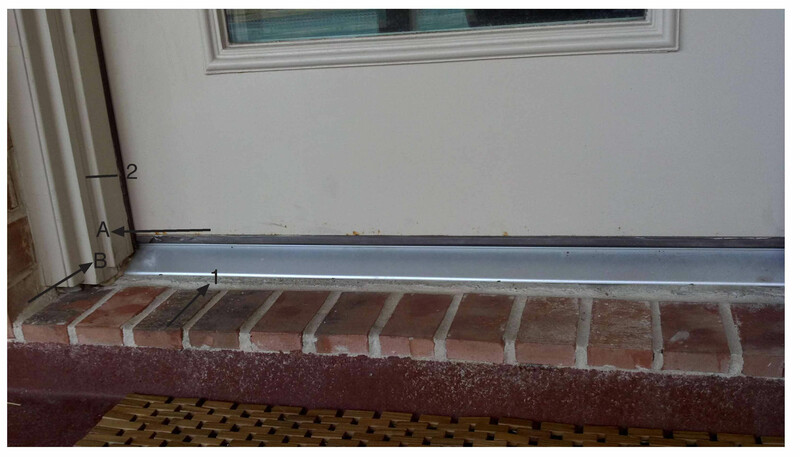 One thing you will need to do is to have a clean square corner between the brick at the bottom and the edge of the existing threshold (marked “1” on the bottom photo) since the bottom rail will have to fit into that corner. It is hard to be sure from the photo but if this is mortar you would have to scrape it out and possibly caulk under the edge of the threshold before installing the screen. If is caulk you would just have to cut it out square. It is also hard to tell how tall the threshold edge is above the brick. 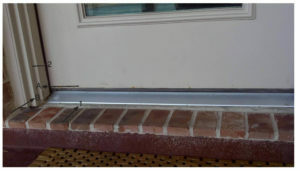 The bottom rail is about ¾” tall so is this edge is at least ½” then there is no need for our threshold adapter. I have included a diagram of the threshold adapter and how it is used so you can see what I am talking about. The two photos at the top of the page show where to measure. One thing to remember when ordering is that since your existing threshold is aluminum color it is best to specify the bottom rail as silver. This makes for a much nicer installation because everything at the bottom matches. As for the color of the screen frames it is hard to say from the photos which would be best. If you send me a mailing address I will drop a set of the color chips in the mail to you today. I’m concerned about heavy wind, can this screen hold up to gusting winds? Thank you for your interest in our Plisse retractable screens. We have tested them against other, traditional style retractable screens and found that our Plisse screens exceed the industry standard by leaps and bounds. You can see the test on our website here: Wind & Retractable Screens Test. But please bear in mind that no retractable screen is designed to be used in extreme wind conditions, you likely wouldn’t want to have you home open during such conditions anyway. I’m very interested in your product but am concerned about the height of the bottom track. All quality retractable doors appear to have both a top and bottom rail. my concern is the possibility of creating a tripping hazard with the bottom rail. The screen would be installed on my front door which is obviously a high traffic area. Additionally, I have elderly grandparents who may need to access my home with a wheelchair. I see that the dimension of your bottom rail is almost 1 full inch in height. Can you address my concern? Thank you for your interest in our Plisse retractable screens. You are right, a quality retractable screen will have both top and bottom rails for added stability and reliability. Our Plisse screens though come with the optional threshold adapter which installs butted up to the bottom rail, creating a transition for the floor height up to the height of the bottom rail. This adapter also works to add even more rigidity to the bottom rail which makes it more suitable for wheelchair access without having to worry about damaging the bottom rail. You can find pictures and more information on our threshold adapters on this blog post and the related posts listed at the bottom of the post. Please don’t hesitate to contact us if you have any other questions or concerns. Can the screens be used on French doors that open out to the outside? It seems that in all the pictures I’ve seen the doors are opening up into the house and not to the outside. Yes, our Plisse retractable screens are meant to be used on both in-swing and out-swing doors. But since most of our customers are DIY installers and most doorways are in-swing we have trouble getting back pictures of installations on out-swing doors like yours. We are currently offering a special offer of $20 off if you provide us pictures of such an installation that we are able to use on our website. If you’re interested in more information regarding this limited time special offer please contact Katrina at katrina(at)plissescreen.com. I want to put these screen doors on three doors on my boat, all three having different dimensions and being ‘submarine’ type with rounded corners, thus making the entire install outside the frame. The doors measure OD: port side 70.25 H X 26.5 W with the retracted screen on the left; starboard side 75 H X 26.5 W, screen on the right, and the cockpit measures 78.375 H X 29.125 with the retracted screen on the left. What do I need, what does it cost, and how do I order? My best suggestion for moving forward with your unique retractable screen needs would be to email me some pictures of the openings. Though it does sound like you shouldn’t have a problem surface mount installing all of the screen on the exterior of each of your three openings. The cost for the opening size you mentioned would be $199 each, including free UPS ground to any of the lower 48 states. The surface mount adapters are an additional $10 each for this size and it sounds like you may need a couple per opening. We’re happy to help you place the order, just email me, call our office at (512) two six four – 9827 or you can place the order yourself on our secure online shopping cart.